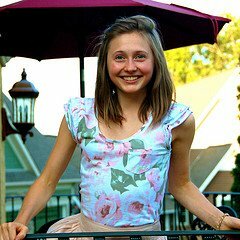 Recently I introduced you to a spunky 18 year old, Caroline, in her guest post, Are You Gutsy Enough to Be the Weirdo? Today, she's sharing the story of something scary that happened to her recently. A mattress. What do you think of when I mention that word? Soft, fluffy, sleepy, comfy, warm, safety, and bedtime stories. I used to correlate these words with a mattress too, but not anymore. Do you know what I think of when I hear the word mattress? TOXIC! My mattress is passed down from my grandma’s old guest room to my room. Who knows how old that thing is? It squeaks every time you touch it, and it gets really annoying. So, my parents think it would be nice to buy me a new mattress. They take me to the mattress store and I jump from bed to bed laying down on each one trying to figure out the best fit for me. Now that I look back, I can’t believe I even did this! Good thing my dad said that the memory foam mattresses are too expensive. I later find out that they are filled with the most toxins compared to regular mattresses. We bring home the mattress that day and I sleep on it for 12 days. On the 12th day, I am driving home from a GAPS class at my local chiropractors office. My vision starts to get blurry, so much so, I thought my eyes were watering.  It is dark and all the car lights keep blurring out. I just keep driving telling myself 2 more minutes. This was a bad idea; next time I am calling my mom to pick me up! No, thank goodness I did not get into a car crash, but it does get pretty bad from here on out. I get home at about 8:00 pm and crash onto my new bed. I am feeling so nauseous and tired that I just go straight to sleep. I sleep until 11:00am the next morning (that's 11 hours!). I normally only need 9 hours of sleep when I'm feeling well. Obviously something is already wrong. I wake up feeling like I'm drunk. I have never drunk before, but I am guessing that is what it feels like to drink too much. I walk (or should I say sway) down the stairs. My eyes are still blurry and it feels like I have a stack of books on my head and 20 more pounds added to my body. Everything just feels so heavy and slow. By this time in my life, I am used to getting sick frequently due to my low immune system. Whenever I get sick, I always review the past few days to try and figure out if it is from a reaction, if it is a bug going around, or die off from the GAPS diet. No one that I knew of was sick at this time, so it must be die-off or a reaction. It is not a surprise, since I am a research maniac, that I start to panic about the latest thing I read, toxic mattresses. How coincidental is that? I thank God every day that I caught it this fast, and didn’t let it go on any longer! It takes a few hours to wrap our heads around the situation and to fully understand that new mattresses are toxic. Our biggest challenge to overcome is why do “they” sell or even make something you sleep on toxic? But then again, think about what is in Doritos and Fruit Loops. These are not banned from grocery store shelves, and people eat that stuff! My mom and dad get on the computer and do what I would have done if I weren’t totally toxic. While I lie curled up on the floor useless, they research like all angry parents do! Did you know what they find? Let me show you some of the information, you will be shocked! The new flameproof mattress regulation (July-07 National, Jan-05 California) requires all mattresses now withstand a severe open flame test. This requires known acutely toxic and cancer causing chemicals in or next to the surface of all mattresses. It is proven we will absorb these chemicals every night. There are no labeling requirements for these chemicals. Many major mattress manufacturers have admitted to news media they are required to use, and do use these chemicals in their mattresses. But then these same and almost all mattress manufactures deny using chemicals to their customers, even ones who have gotten sick. Organic mattresses often claim to use wool to pass the open flame test. Wool burns at 600 degrees and the open flame test is 2,000 degrees for over a minute. It is scientifically impossible for untreated wool to pass this test. Since there are no labeling requirements for these chemicals even the wool and other fire barrier suppliers often tell mattress manufacturers their systems contain no chemicals. Unfortunately, many mattress manufacturers and consumers want to believe this. Antimony (a heavy metal almost identical to Arsenic), Boric Acid (yes, the Roach Killer), Silicon (Silica Glass, a known respiratory hazard and carcinogen), Melamine, Formaldehyde, Decabromodiphenyl Oxide, and Ammonium Polyphosphate are the main chemicals being used by mattress manufacturers to meet the new state and federal flammability standards. So, immediately my angry dad calls the mattress company. He is mad but wants to test the company. He asks them if their mattress have toxic chemicals on them, and they deny it. This makes him very upset that his daughter is intoxicated from a place that claims they are safe! With in an hour, my dad calls up his buddy to help him take the mattresses out of the house. Good-bye toxic beds!! So in the mean time I have no bed and I am so sick that I am falling over when I try to stand for more then 10 minutes. I have to admit, this is one of the hardest things to overcome so far in my life. To this day, any mattress freaks me out. It takes me about 4 weeks to finally sleep in a bed again. I sleep on the bathroom floor for many nights. My eyes are dilated for 2 weeks straight, even in bright lights. My speech is slurred for several days. My brain is just all jumbled up. Sometimes I cannot connect a thought to an action, like I try to pour a glass of water but I actually will pour the water on the counter. I cannot walk or run for about 1 week without constantly falling over. My face swells up like I have an allergic reaction. Eczema spreads all over my body. I do not even dare drive anywhere because my coordination is so off. Now I have learned more about what happens to my body. The cortex of my brain (coordination part) is really affected when I have a reaction. I am able to start doing normal activates again after about 3 weeks. Though it take a little over 2 months to be totally better from the exposure to the toxins. So in these 3 weeks where I am pretty much a vegetable, I detox. I have just started GAPS 4 months before this happens. I go back to intro, but the broth makes me so nauseous that I cannot even look at it. Cooked and fermented veggies do the same thing. I pretty much eat protein, fat, and raw vegetables. I really am not hungry, but I force myself to eat at least something every day. I also do not have my own Infrared sauna at this time, so I drive (actually my mom drives me) to Minneapolis 2 times a week and we pay $25 for a 1-hour session. This is probably the best thing I do for my body! I do not sweat the first 5 times I go, and the temperature is easily 120 degrees. This shows how plugged up my detox pathways are. After the 6th time, I pour sweat, and this is about the time I start healing. On the days I do not go to the sauna I take a hot Epson salt bath or clay bath to soak up the toxins. I religiously chug bentonite clay morning and night, as well as apply my magnesium oil so I don’t get a migraine. Good thing I know what to do, because I have no energy to research. Life is pretty miserable, but I get over it. What about my old mattress? So you are probably wondering, why not just put my old mattress back? Well we gave it away, and there is no way of getting the same one back. The old one didn’t make me sick because it was so old that it had plenty of time to outgas. Also, the mattress was made before 2007 so there is a possibility that there were not even flame-retardants on it, or at least not full strength ones like now days. After a big dispute about returning the mattresses, my dad just goes all out and buys my 2 sisters and I new mattresses. My parents and brother have old mattresses, so they are safe. I have to say, it is not cheap, though for our situation, we have no choice. Beds that have been out gassed for many months are much better then a new one fore sure. Ones from second hand stores that are in good condition could be fine. Old mattress made before 2007 are even better. So we got new non-toxic mattresses. Even though I am allergic to latex, it is covered and I do not get an allergic reaction. I cannot be happier with this choice! There are natural mattress stores out there or even people who make natural hand made mattresses. You just have to do a little research. I still look back at this situation and it freaks me out. I have overcome my mattress fear, enough to sleep only on my organic mattress. It is very unfortunate that this had to happen to me, but it is also a blessing because now I get to tell you all about it and warn you before it is too late. My words of wisdom to you, don’t buy a new mattress! I am also extra sensitive, so if this happens to someone else, they may not have a full-blown reaction like me. It is always better to be safe than sorry. I hope I didn’t scare you all too much; I just want to share my story to make people aware of the scary stuff that our country allows. Has this ever happened to any of you? Or something similar? Stop by Caroline's Gutsy blog and check out her yummy GAPS recipes! I SUFFERED OF 2 PANIC ATTACKS AND HALLUCINATIONS AFTER USING A PVC MATTRESS AIRBED!! You can’t believe what happened me. I have never, never suffered of this in my life…..
After investigating a little bit, and carefully reflecting about it, i absolutely started to think that the cause of this was the toxicity of any material that i was using during the previous days, especially because i was having for the first time in my life serious hallucinations,something that it’s usually related for example to some toxic drug pillows young people use on saturday nights ( i have never made use of such pillows anyway). Due to this, i immediately recognize the problem…it was the PVC airbed i had just bough the previous week!! The main clue has been the terrible rubber smell which really made me suspicious about it….. YES IT WAS THE AIRBED TO CAUSE MY PANIC ATTACKS AND MY HALLUCINATIONS!!! After recognizing this, i immediately removed the airbed from my room, and started to sleep in the sofa the same night i had the second panic attack. Well, after less than 5 minutes since i moved from the airbed to my sofa, everything disappeared (both allucinations and panic attack). I slept very well until the morning without any further panic attacks. However, the toxicity symptoms of the PVC, (especially some very little principles of hallucinations, which i managed without too much problems), still remained for the next 2 days in a smaller form, until they gradually disappeared from my body, which completely recovered from the intoxication after 3/4 days. (anyway, starting from the morning after the last panic attack, i was already feeling better thanks to the sofa where i slept for the rest of the night). And then, thanks god, the day after i slept on the sofa, I found on internet many article like yours where it was very cleared the problem, especially the symptoms experienced by some people who slept like me in a toxic mattress, especially a PVC airbed. As you can imagine infact, my friends and my family were not believing me….they though ” what??? are you serious? the airbed is causing this?? naaaah, you are just stressed….take a pause from job and relax!”. However, after hearing their opinion (and getting very disappointed and sad for this), i took my smartphone, i found and opened these articles i found (like yours), and i slammed it on their faces like a door……NOW READ THIS!! Thanks Moyan, I’m so glad you’re better!!! I will never, never, and still never forget this experience…one of the worst of my entire life! PEOPLE, PLEASE STOP BUYING AIRBEDS!! Anyone know anything about Mack O Pedicure mattresses. Just had one delivered tonight. It’s a hybrid between memory foam and coils. Smells so bad I am sleeping on the couch. I’m scared of the out gassing and getting sick after reading about everyone’s experiences. How long does this out gassing last? We purchased a Mac O Pedic 4 yrs ago which started showing body impressions within a few months. For one reason or another (illness, procrastination, etc.) Ididn’t contact the store for a couple of years, but never had a response…and I did not follow up. I now ready to “do battle” with the store owner. Wish me luck. She is also asking about natural and organic. These beds are neither but I would let her know that natural or organic beds do not support your body properly, they don’t have a technology that actually takes pressure off your body, and not only are the usually expensive they don’t last very long. what was the names of the mattress you got sick on? and the mattress you got new did it have latex in it? I have latex allergy I need latex free I am getting confussed with the words natural and organic and I go there and its latex which is not natural for me thanks! I bought a chenille blanket (says made of polyester and acrylic) from Pottery Barn about a year ago that has an awful chemical smell to it. I tried to wash it and it still has a strong oder. I called the company and they didn’t have much to say and said it shouldn’t have a smell. It smells like a conditioner or like a chemical treatment of some sort. Is this common with blankets? Thank you! We bought a Tempurpedic in July 2015. When our bed was delivered there was a very strong chemical smell. I was told by the delivery guy that the smell would leave within a couple days. I asked if it was safe to breath that and was told it was safe not to worry. Well as we slept on this very expensive bed I started getting sicker and sicker. To the point I was at my Drs office 3 times in a week. After numerous blood test that came back negative. I was at a loss as to why I was feeling so poorly. Then one day about a week ago my boss said maybe it’s the new bed making me sick. So I started looking at the timeline from the day of delivery and started reserching the internet and could not believe what I was reading. There were many people with my exact symptoms. I could not believe a bed could make me feel this sick. We immediately took the bed out of the house and started sleeping on our old bed in the guest room.within a couple days I was slowly starting to fill a little better by the fourth night I was able to sleep again and was not waking up nauseated. I’m now going through a detox to help rid my body of the toxic chemicals the Tempurpedic bed emitted. My husband only had a couple issues from the bed which was leg cramps, heat and he started developing a cough that would only occur at night once he laid down on the bed. Unfortunately I had many symptoms occur. Nausea, unable to sleep, heart palpations, itchy watery eyes ( woke up twice with eye crusty, red) which lasted a few days each time. I then realized that every time I went to bed my eyes would itch and burn really bad but would be fine once I was not in bed. I would fall asleep for like an hour and wake up with what I can only describe as a wired feeling and heart palpations and was not able to fall back asleep. I felt like I was wired. I was lucky if I slept 1 or 2 hours a nite. My body felt exremely week, I was unable to concentrate or focus clearly. My Dr. said I was suffering from exteme anxiety and depression ( and I had nothing traumatic happen to cause the anxiety or depression).I also had Night Sweats and It felt as if my body was just shutting down on me. Also the bed still smells really bad and our room that the bed was in still riques of the smell from the mattress. We are airing out the room everyday. The bed is now in a plastic zippered cover in the garage and is now stinking up our garage. Update: We were able to return the mattress. They would only do an exchange so we got the Stearns And Foster Lux Series. They just delivered it this week 9/30\15 . I have it in the room and letting it air out for a few days with the window open. I am really apprehensive about sleeping in the new bed. I just do not want to get sick like I did from the Tempurpedic. The new mattress has a slight new smell to it, which hopefully airs out. Fingers crossed hoping this bed is ok and dosent make me ill as well. How long does it take for a mattress to “out gas” ? I’m working on another post about this soon so I’ll find this out and cover it then. We use the plastic dust mite protectors on our mattresses. Wouldn’t that help? I think one of the biggest issues is the off-gassing, so a cover wouldn’t help that. Had similar experience as you, purchasing a new materess . with in the first few days i had lung problems and ended going to the hospital three nights in a row. Didnt know why. MY immune system was not strong because of recovering from cancer so i thought thats what it was. As time went on both my husband and i both were suffering from felling sick, out of balance , staggering, blurred vision, muddled thinking, the list goes on. similar to went you went through. I talked to the place where we purchased thew mattress and no response. could not get refunded. So my husband and i would like to get rid of this brand new mattress but not sure what we should buy to replace it. Jae, We have similar chemical issues in this house and found a great company that actually makes affordable non-toxic mattresses with organic cotton and natural wool. The twins start at $494 and the beds are awesome. My kids and I all sleep on them. http://www.mygreenmattress.com. They are handmade and sold factory direct so that you don’t have the markup like other companies. You can find out more info on their website and they also have a lot of great info out there on the mattress underground. I got a hand made wool bed 3 years ago to avoid the toxins. It is suppose to be great for you bad and stuff….I have never had so many back issues in my life! I am going to try to get an organic bed but the lack of continuous sleep over the past few years is as equally unhealthy as the toxicity of a new bed! I bought a new mattress on Friday. I woke up to Vertigo on Monday morning. Unable to walk for over three hours I laid in bed waiting for the Dramamine to kick in. Went to the Dr.then did my own investigation. I was horrified to read the postings on the compute about new mattresses. I’ve had headaches, dizziness, and trouble with my balance. I have encased my mattress in an allergic cover and aired out my house. I now need to detox myself and hope people read this before buying a new mattress. I’ve been deeply disturbed by these stories of mattress off-gassing. I just discovered this issue this past week & believe it to be responsible for my 12 years of illness! It all started when we bought our Stearns & Fosters king mattress & boxsprings. Although it was 2002, I believe that this mattress is my source of misery! Not to mention overnight stays at a hotel & a relatives home where I’d slept & had terrible reactions almost immediately! I just purchased a new organic latex mattress yesterday and cannot wait to get this toxic nightmare of a mattress out of my home. I am grateful for you sharing your story, Caroline. I am sorry you were affected by this. I have felt like a crazy person for all this time, have been through so much myself trying to find causes for my illnesses (muscle spasms, sinus inflammation, rashes, memory loss, etc.) through doctors, tests, changing my diet, having my air ducts checked for mold, I could go on & on. I now believe it is all the mattress to blame. Okay, I’ve read a bunch of the entries on this page and feel compelled to explain something. The toxic reaction that we are all experiencing falls under the category of “endocrine disruptors”. Humans have an endocrine system that exists of the pineal gland, pituitary gland, pancreas, ovaries, testes, thyroid gland, parathyroid gland, hypothalamus, gastrointestinal tract and adrenal glands. These glands secrete hormones that regulate and tell our bodies what to do (e.g., regulate body temperature, blood sugar, etc.). These chemicals that we are taking in act like a synthetic estrogen and wreak havoc on our normal endocrine function, thus the term endocrine disruptor. I believe everything you said because I have multiple chemical sensitivities. I put organic cotton mattress covers over my existing Simmons mattress. Simmons is a terrible mattress, chemicals or no chemicals. They sag. I need to buy a new mattress because this mattress is destroying my back. I will try some of the suggestions on this page. It’s no wonder that we have an epidemic of people who have cancer. Among all of the other chemicals and toxic food they are exposed to, they are sleeping in a cancer-causing bed. I think the government and the corporations are doing it on purpose to make money. There’s big money in making people sick. It’s just unconscionable. Yes… My son just went through the same thing. New mattress from sleepy’s 3 weeks ago. Started feeling strange after one night. (3) doctor visits and (1) ER run later… Numbness, tingling, vision issues all due to mattress chemicals. To their credit sleepy’s took the mattress back and he purchased a Carolina Guild green mattress. No more problems…. How about the baby mattresses? The little ones can’t tell you about things. I have to believe the same issue applies to those mattresses. Shame on Federal Regulators for the lack of oversight. Pass the word and lets push for a change in the industry. Regarding Naturepedic… my shop, Moss Envy, sells Naturepedic mattresses and accessories. We’ve had great luck with both Naturepedic and Savvy Rest. There’s a lot of BS out there that you have to weed through. These two brands are the real deal offering the cleanest and most reputable mattresses out there. Ryan, I spoke the Naturepedic company and was not satisfied with the information given to me. I was told that their 100% all organic mattress (without any wool) passed the flame retardant test and that no doctor’s note was needed. They tried to fool me ( they did not know my extensive experience and research on the subject) as I know this is a big fat lie. They kept trying to push the deception that because this mattress was 100% organic cotton it passed the test! Every other mattress company that I have contacted backs me up in this as they cannot sell organic cotton mattresses, without the wool, without a Doctor’s note. In fact, I am going to contact the appropriate regulatory agency and see how they feel about Naturepedic’s claim. So, as the organic cotton alone cannot pass the test, what are they using that they are not disclosing? I don’t know, but hopefully someone else who does will jump in! I had a weird experience in 2004. I needed to buy a new bed for the guest room, so I bought a queen mattress at Sam’s Club. I brought it home and leaned it against the wall ready to go upstairs later. In a little while, the fire alarm sounded. The alarm company called and I went around the house, and no fire or smoke. Reset it, and it kept going off every few minutes. Finally, I realized that the mattress was right under the smoke detector and remembered that I had heard that strong chemical smells can make a smoke detector activate. We took the mattress upstairs and the alarm stopped going off. I closed the door to the room and left the window upen for several weeks, and the strong smell dissapated (although I’m sure it was still out-gassing). It was rarely ever slept on in those 10 years. This shows that even the older mattresses (before 2007) had chemical problems. I just recently started sleeping on it as I sold my other bed, and HAVE been having problems sleeping. Not sure if it’s still the mattress out-gassing or stress! But in any event, I’m moving out of state soon, and will most likely just get a new organic one after the move. I hate buying any new soft furniture or carpeting because of this out-gassing. I once heard that an ion-generator can help get rid of these fumes in a room, but don’t know for sure. A friend of mine who was very sensitive told me this and used this method. Another area for research. Thank you for your posts and making people aware of this big problem and for the posts of those with links and solutions. IKEA mattresses are even worse when they get old. I got one of those $150 tightly-rolled ones. After a few years it started to smell, so I saw the cover can be zipped off to wash. Whoa! you never smelled a stink like an IKEA mattress cover when it gets wet — makes your eyes burn. It took me over a week to start feeling better once we got our new, expensive, toxic Simmons mattress out of the house. Thankfully after a lot of research and shopping around, I purchased a very “clean” Berkeley Ergonomics mattress. It is a latex and innerspring combination with no chemical fire retardants. Wool is used to pass the fire inspection requirement. I have had this for over a year and it is great. I have had similar reactions on hotel mattresses a couple of times, but once I get away from them, I feel better after awhile. I hope that your husband feels better soon! My husband has been very sick from our new mattress. We have been sleeping on our old mattress until we can get an organic one. The first week we didn’t sleep on the toxic mattress he felt yuck the first two days but then started to feel good for about 4 days and then went back to yuck. I have a feeling it is the mattress but don’t know how long it will take his body to go back to normal. I just had a similar experience with a memory foam pillow – as in the past few weeks and I returned the pillow today. I needed a new pillow – one with lots of support and wouldn’t go flat after a few weeks of use. So I bought a fancy memory foam one. It smelled, but I knew that the odor would dissipate in a few days and all would be good. Right? Wrong. After a few weeks, I was so sick. I had a constant headache that did not get better with medicine (I never get headaches), muscle weakness and pain, extreme fatigue (to where I’d sleep for 12-14 hours a day and still be so sleepy I could barely stay awake), lightheadedness, concentration and memory problems, extreme hunger but eating anything would make me nauseous, my skin on my face broke out in rash/acne (I don’t normally have acne problems), and sinus pain. When I realized it might be the pillow, I slept on the couch. I woke up without a headache and with tons of energy – more energy than I would normally wake up with! As soon as I walked into my bedroom, the symptoms returned. I stayed out of the house most of the morning and the longer I was gone, the better I felt. I came home and immediately started feeling bad again. I opened up windows and felt a little better. It may take several days of airing out the house and a deep cleaning to get rid of the chemicals in the air, but I’m glad I was able to pinpoint the problem and take care of it. My husband and I are talking about buying a new mattress for us (I got ours as a hand-me-down 25 years ago) but after this experience, I’m definitely going to be careful about what we buy. I’m glad I learned the lesson through a pillow – pillows are easier to return than mattresses! I stopped using a mattress and now sleep on the floor. I just purchased a new mattress but had frequent awakenings and was fatigued after waking. In other words, my sleep quality was quantitatively and qualitatively poor. I learned about the horrible chemicals in conventional mattresses and other products. After I switched to sleeping on the floor with an army sleeping mat and heavy blankets, my sleep quality improved dramatically. I also air out the house completely morning and night regardless of the outdoor temperature for air exchange. I got rid of most cleaning products and store chemical containing products outside of the house to prevent off-gassing. I found that using plain ole soap and hot water decontaminates just as well as products with harsh chemicals. I recommend anyone with chronic fatigue and poor sleep to try improving the indoor air quality. I am sorry that you are having this problem. If your symptoms are caused by the mattress chemicals off-gassing, Lysol will not help. I would suggest that you experiment to see whether your symptoms go away if you sleep elsewhere for a few days. I tried that by sleeping at a friend’s house and mine totally disappeared. When I returned home and got near the mattress again, the symptoms came back. I had to remove my very expensive brand new Simmons Beautyrest Black Ansleigh mattress from my home in order to regain my health. I ended up having to purchase a new chemical-free latex mattress by Berkeley Ergonomics. I got mine at Sovn in Dallas. It was a costly thing to find out that I am sensitive to mattress chemicals, but I am so glad that I found the problem before my health was severely threatened. Good Luck! In the Chicago area you can buy a handmade chemical free mattress. Quality Sleep Shop uses wool as the fire barrier. No flame retardants. Thy’ve been in business since the ’60’s and are the parent company for mygreenmattress.com. The Pure Echo is very reasonably priced. Meant for kids. They get great reviews on the mattress underground. This is very hard to believe. It sounds like the poster has other immune deficiency issues. It is much more likely that this is an issue of causation vs. correlation. My TV, computer, and iphone, all have toxic chemicals. If I get a headache it would be odd for me to assume it is caused by one of these things. Same with your mattress. If true, you certainly would have an obligation to test this out. Go to the store. Tape the conversation. Ask the sales person for a copy of their policy and have it in writing that it is not toxic. Go to a sleep center and sleep for a few weeks until a reaction occurs. If it does, you will have millions of dollars. Well worth a few nights of discomfort. Well believe it. We bought a new Tempurpedic bed and after a week of sleeping on it became very ill. It took us a month and a half to realize it was the bed. We took it out of the house immediately and slept in another room on our old mattress which is 10years old. By day 3 of sleeping on old mattress I started to feel better it has been just over a month and I am starting to feel like myself again and that after going through a detox period to get The chemicals out of my body.The only thing that had changed in my life was that new bed. So I am here to tell you that the chemicals they are putting in beds are no joke and they can make you very sick. Wow! 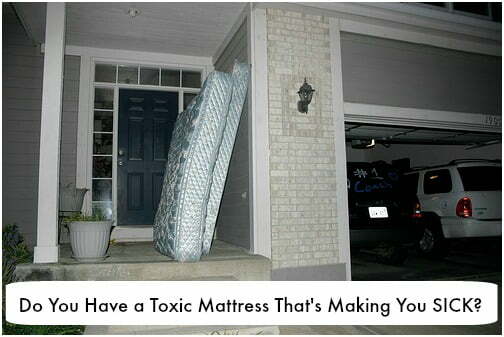 I never realized how toxic mattresses can be. We are exposed to way too many toxins. No wonder so many are sick. I recently read something about zeolite powder and how it removes heavy metals om the body. Of course it has to be the kind for human consumption. I don’t think a used mattress is the answer either…. Mattress break down and the dust is very toxic. You mention there may have not been flame retardants on your mattress since it was from before 2007, can I clarify? Flame retardant laws have been around since the seventies when the rage of smokers caused so many hotel bed fires. The most recent update to the flame retardants laws was made in 2001, when they banned PDBE’s (very hazardous) to allow borac acid (a pesticide). Interestingly enough, someone was just telling me about a soy foam mattress she bought that was supposed to be natural yet it was treated with borac acid. She took it back. Also, did you think of me when you wrote handmade mattresses? That’s how we’ve been working out craigslist ad. So if anyone local (Twin Cities) wants a hand made chemical free mattress, look us up on craigslist or facebook: Natural Mattress Co. I came across this blog post on Friday researching sensitivity to chemicals in mattresses. Right now, I am feeling like I am going crazy. We needed a new mattress and after much research to find one that we thought would last, got a Simmons Beautyrest Black model. The bed was delivered on Monday Sept 24. I slept horribly Monday night and kept waking up with my heart beating really fast, a very dry mouth, nervousness and a feeling of my brain being totally “turned on,” as if I had an overdose of caffeine or something. I did not put it together until Tuesday night though. When I tried the mattress again, I made it two hours until I had to leave my bedroom and go out and sleep in the living room where the symptoms subsided after an hour or so. Wed and Thurs nights I slept in my son’s bed. I slept well without symptoms on Wed., but Thurs. I even started feeling them in his room. Friday I tried the bed again, because I didn’t believe it really could be the cause. I noticed that every time I moved in the bed, I immediately felt my heart racing and the symptoms worsening. Needless to say I did not make it through Friday night before it was back to the couch. Last night, I slept in my youngest son’s room which is farthest away from our bedroom. I felt the symptoms in a milder form all night and I am quite sure that these gasses are now in my whole home. I feel like I am going crazy. I have to either go somewhere else to feel better or get this thing out of my house as as soon as I can. Caroline, was your Dad able to get his money back for the toxic mattress? If so, how did he go about it? We live in East Texas and there are not any organic mattress stores here. Does anyone have a suggestion about where to get a toxin free mattress in the Dallas/Ft. Worth area? Lisa, I don’t know about local but we have bought 2 from cozypure.com and recently bought my parents one. The company is dedicated to environmental and human safety. Their customer service is top notch and they will even send you samples of everything that would be in the bed you’re considering, so you can see how you like them. Good luck! Different people respond differently, but when I hear these symptoms I wonder about pesticide exposure. Is it possible that mattress makers or resellers are pre-treating for bedbugs? Or by any chance did you use pesticide / bug spray in the bedroom around the time you switched mattresses? Hate to tell you, but wood from the hardware store, ESPECIALLY OSB, does equal to or more degassing as those matresses you’re trying to avoid. Also blankets come full of the same toxins to protect the color, so give them a good hot water bath when you buy them. Thanks for sharing your story! It did cross my mind that we had gotten a new mattress, but I thought I was just being silly. I am so sorry for all you have been through! Thank God he makes blessings and passions arise out of suffering! I thought this was more widely known actually…that mattresses have toxic flame retardant chemicals all over them. LADIES…PLEASE think about this when you’re buying your crib mattress too!!!! Natura, Naturpedic, Nook, and Moonlight Slumber are some fantastic choices! We just bought my twins a Moonlight Slumber twin size mattress for their last birthday and they’re great. White Lotus in NJ is a great place for organic, chemical free mattresses. Our family became very chemically sensitive after living in a house we bought for a year that had black mold. Their prices are reasonable and they are a very friendly, dependable company. We bought all of our mattresses and a sofa and loveseat from them. The timing on this article is amazing! I just had a brand new organic mattress delivered yesterday from TheNaturalBedStore.com. It’s made with organic cotton, wool, and pure Dunlop latex made from rubber trees. I did a ridiculous amount of research to find a mattress that wasn’t loaded with chemicals and was still affordable and comfortable. I took a leap of faith on the comfort level since I had to order it online, but their customer service was incredibly helpful in answering all of my questions and took the time to consider our sleeping positions, weight, etc… I’m happy I spent the extra money to get a mattress that won’t make me sick! Im so happy you made that investment Debbie 🙂 research is well worth your health! When my babies were newborn I sought out and purchased mattress wraps that allow ventilation of toxic fumes below the bed. I combined that with a circulating ceiling fan that brings the fumes down and across the floor where high powered air purifiers took over. To this day I wrap their mattresses and air purify their rooms. Just search up mattress wraps!!! 1. What is your mattress’ flame retardant? 2. Latex? Is it blended with anything else? 3. Are all the components certified organic? 4. Does this mattress off-gas any VOCs? 5. What if I don’t like comfort of the mattress? 6. Will this mattress take on a body impression? 7. 3rd party emission testing available? 9. Where is the mattress manufactured? Please feel free to use Moss Envy as a resource. Check out our website and use the contact us form. Thanks! Wow thanks Ryan for those good questions to ask! Love you little list and so helpful to readers. I had a similar problem with a 2 1/2 inch foam mattress I bought at CostCo. The smell made me sick to my stomach. It said to “air it out” for a few hours before use. It was so bad that it took 2 weeks for it to even subside just a tad. Everyone told me I was being ridiculous and that I was being super sensitive. No kidding! I felt like vomiting, felt sluggish, sick to my stomach, gave me a headache…I really didn’t put it together until I though it through. By that time I figured it was the mattress. I left it uncovered “airing out” with 2 opened windows for two and a half weeks more. It was still difficult to sleep on it. This was for a twin bed. Could you immagine if you have to sleep on a KING? You’d be in the hospital with all those toxins surrounding you. I am so happy you figured it out and quickly. It is a shame that natural things cost so much. You would think that without the additives it would be cheaper. At this point I am going to have to “save up” just to buy a mattress. That’s an interesting story, I’m glad you were able to figure it the cause and deal with it. I was reading the book Clean Green and Lean and the author mentioned this type of thing happens to people with all sorts of building materials and furniture, such as carpeting, sofas, plywood, etc. Many offgas formaldehyde and other chemicals for many years. Cars do this as well, that is much of what causes ‘new car smell’. I have many sensitivities to anything new, after this happened I became even more aware of how toxic our world is and how we have to take special care not to fall into its traps. There are some ways around the toxicity (organic, handmade, outgass, second hand..) but of course we have to live in this world and just do our research! Do you know nothing about spaldin? We have this brand and they do not have boric acid and are made from a soy foam. My husband cannot stand sleeping on them or any other mattress we’ve had without back issues and I’m not sure what to do. He needs a hard super firm bed but I need a softer one. We have considered the sleep number but Im sure the topper is toxic so not sure what to do. BTW, I’ve seen a slew of recommendations for the Lifekind mattress when I posted a link to this piece on my FB page. Worth checking out, too – though it wouldn’t address the different wishes of the sleepers. Try a cozy pure mattress!!!!!! cozypure.com we have 3 and will never buy a different kind! I too enjoyed the feel of a memory foam mattress in the store, but learned quickly how allergic I was to the toxic fumes that come from the new mattress. I could not be in the same vicinity of it and not feel sick. They don’t “air out” quickly either. They say that the odor is gone in 24 to 48 hours, and that is simply not true in my experience. A new mattress is on our horizon again, and I never considered toxic chemicals lurking on the traditional coilspring mattresses as well. This gives me much to think about. Have you tried an Essentia mattress? They make completely natural memory foam (sooo comfortable) that is toxin-free and made of rubber tree sap, essential oils, plant extracts, and water. The website is also suuuuper helpful when you’re looking to buy an organic mattress, they have some great informative resources. Mattress companies don’t always know what they are talking about..its up to YOu to do research! I just wanted to throw out the name of someone locally in the Minneapolis/St. Paul area who makes wonderful homemade mattresses. They use a latex core with lots of wool batting around it, and then put it all into a cotton futon cover. We purchased a twin mattress (for our daughter) from them about 8 months ago, and it has been fantastic! We laid it on a big piece of plyboard, resting on some slats on the frame. Our daughter sleeps great, and I actually love sleeping there as well! We’re hoping to get a queen sized one for when our new baby arrives in December (we co-sleep). The name of the couple who makes the mattresses are Bob & Deborah Brenton, and their phone # is 763-445-9676. You can also email Deborah at [email protected]. The prices are VERY reasonable as well for a natural mattress. I think we paid around $275 for the twin, and if I remember correctly I think she’d quoted us about $350 for the queen. There are 2 different thicknesses you can choose from, and we thought the thinner one was all we needed, so the price would probably go up slightly if you wanted a little more cushion. Still, this is a steal of a deal compared to the $3000+ natural mattresses that you get elsewhere! What an ordeal over a mattress – who knew? I’m glad you recovered from that. I don’t suppose it would’ve worked for you cover the bad mattress really well? Buying 2nd hand mattresses should be inspected really well and cleaned before using. Thanks you for sharing – I will share as well. no I had a cover on it and still reacted, I’m super sensitive. Yes inspection and cleaning is a must too! Would you consider adding a note to discourage new parents from ever buying a 2nd hand mattress for a baby? The sweat, spit-up and shed skin cells mixing with the flame retardant chemicals forms a nerve gas and is the cause of SIDS. The older the mattress, the more likely a baby is to die sleeping on it. This is the reason that 2nd, 3rd and 4th-born babies die more often of SIDS, as do children living in poverty: it’s the hand-me-down mattress. For $200 you can get a baby a Naturepedic all natural mattress and I bet the prices are coming down all the time as the competition jumps on the organic bandwagon. Here’s lots more information on non-toxic mattress makers. https://therobynnest.wordpress.com/2011/03/30/my-head-is-going-to-explode/ Thanks! Thanks so much Lynne! Yes it was a good outcome and look how many people I shared it with too! Would you give me permission to re-blog this story on Moss Envy’s blog? If you would let me, I would be happy to credit you however you wish. Let me know. Thanks! Of course you can! I sent an e-mail to you to tell you YES as well 🙂 thanks spread the word! I posted a link to this story on Facebook, and got the following information from one of the most knowledgeable people in the non-toxic home field, Mary Cordaro: She said that wool does not need to be treated in order to be non-flammable; in fact, that was a myth started by conventional mattress makers to slow down sales of non-flame-retardant mattresses. Thought you’d like to know! I am so glad to see some posts about healthy mattresses! My husband and I were needing to replace our pillowtop mattress earlier this year. After much research, we determined a solid latex mattress would be the best option. We ordered our bed through FloBeds. They are a great, small company to work with – excellent customer service. We got the PostureDeluxe model when they were running a 15% off sale, and we absolutely love it. It is 3 layers of latex on each side – so for me, my side is firm, medium, medium, and for my husband, his side is extra firm, firm, medium, I think. And then there is a thin, soft latex top layer that goes across the whole top. It comes with an organic cotton/wool “cover” – you stack the layers inside, then zip it up, and it looks just like a regular mattress. Absolutely no off-gasing – just a faint, natural rubbery smell when you are putting it together. The wool in the cover serves as a flame retardant, so there are absolutely no chemicals, yet they still meet the fire requirements. The wool also helps serve as a moisture barrier, and both the wool and latex inhibit dust mites. We couldn’t be happier – 20 year warranty. It was expensive – we paid about $3k, but the other option we were considering before doing our homework was the Tempurpedic, which is also very expensive and laden with toxic chemicals. Our old pillow-top was $800 and only lasted 4 years. I think in the long-run, the price evens out, and we get to have a comfortable, healthy mattress for all those years. It is definitely a good investment if you are in need of a replacement mattress. Caroline… thank you for sharing your story. I am one of the owners of Moss Envy. We are so happy you are feeling better and thrilled that we could be (part of) the solution to your El Stinko mattress situation! 🙂 Unfortunately, we hear horror stories like yours all the time. Tina (my wife and co-owner of Moss Envy) and I have helped hundreds of individuals get in a comfortable, non-toxic, and healthy mattress! We will cut through the BS that is found online and present you with the transparent facts! And the best part is you get to lie down and TRY the mattresses! We now have FOUR different, wonderful, non-toxic mattresses in our showroom. Please check out our website or come in. We would LOVE to help you like we helped Caroline! I know this sounds a little like a commercial, but we really do feel passionately about this issue and we want to help. Thank you. Ryan, thanks so much for your wonderful help getting me though this tough time. Your moss envy mattress is wonderful! It treats me well 🙂 Thanks for helping all these people! I haven’t read all the comments, but in case no one else mentioned it, pillows can be toxic too. Thank you Caroline and thank you Kelly for posting this peace! Caroline, my kids bug me every time they see an add for those “squishy” mattresses. My daughter is 11 years old and just doesn’t want to hear it from me. So glad I can send her your direction. Someone closer to her age. You know, I do think it takes a Village to raise our families. So grateful to have you all in the village. BTW: about 3 years ago my husband and I got a bamboo bed. I too was freaked out by the prospect of outgassing. We have had no problems and have been really happy with it. We also diffuse Purification and other essential oils on a regular basis. So glad you wrote about this, Caroline! Daniel and I bought a memory foam mattress for our new house as newlyweds and my health issues got really serious right after. It didn’t really occur to me that the mattress could be a factor until long after. So glad you made the connection and got rid of it! Thanks Heather for reading this, I am glad you finally figured out that your mattress was causing problems. Better now then never! When I went mattress shopping late last year, so many of the new organic mattresses were very complicated and included man-made or questionable materials. We have a memory foam on top of our matress right now. I knew the info of older matresses(before 2007) were better which thankfully my son’s matress is then. But our memory foam I can ask my mom how old it is but if its before 2007 would it be ok? I’m thinking not and that either way we need to get a cover. Below the memory foam we have an old matress.. I think another question is to ask how we can strengthen ourselves against this stuff. Some people obviously are not affected by the chemicals. It’s a sad state that we live in such a toxic world, but until that changes (no time soon) I want to know how to make our bodies more resilient. I am doing the GAPS diet to hopefully heal my gut and make my body stronger. visit my website gutsy for some GAPS recipes. Glad to read this. We have been wanting to replace our 10+yo mattress for some time b/c of chronic aches and pains and fatigue. My girlfriend tuned me in to a mega furniture store that you can get a great financing deal and I was all excited to just go get one since we’ve waited so long. Guess I will be doing some research – thank you for all the links! Kelly, you may have done a piece on this before, but this whole topic reminds me of my discussion w/ my girlfriend the other night about a friend of hers who wasn’t sleeping well in their new home. She was chronically ill and finally called in an environmental specialist who found a braker box in the room right below her bed. When they got that all taken care of, she recovered. All of the environmental variables are just maddening! Wow This is an amazing discovery for your friend! Yes, research is a must when it comes to pretty much anything man made these days, thanks for string your story, it will help others too! I have some links listed above in the comments. I am really happy to read this! I have to buy a new mattress soon because I am starting my own place in a new state and new apt. What kinds of mattresses do you suggest? Organic latex ones? Are the memory foam ones toxic too? Hi Meagan there are lots of good suggestions I mentioned as well as other readers in the comments above. Best of luck to you on your move! One other question: How long does it take to “devolatilize” a store-bought mattress? Like, is a 3- or 4-year old mattress safe? My husband and I were getting ready to replace our old mattress when I started researching all the nasty chemicals. We decided to keep our old mattress as long as we can because we simply can’t afford an organic one right now. My distrust of manufacturing companies has me at a point where I will probably be making my own mattress within the next few years. I don’t know how else to ensure it is actually free of chemicals, and that the claims aren’t a lie. I plan to use a kit from https://openyoureyesbedding.com/ when it’s time, and will it with wool and buckwheat hulls. She has taken all of the guess work and trial & error out of the process. Call me when you start to make your own! hehe 🙂 You are so good! I too don’t trust company’s anymore. Not after they did this to me!! 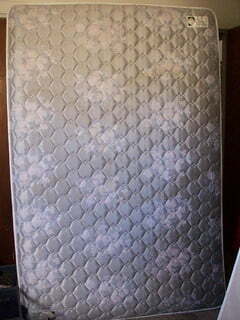 Does anyone know if the same sort of chemicals are used in foam rubber “mattresses,” such as come with some bunkbeds? If they also are toxic, are we to be concerned about all foam rubber products (e.g., sofa cushions)? Or is it just the constructed mattresses that have the fireproofing chemicals? Hmm. I am not sure. If they have no fabric they are probably safer because of the fire retardants, though still probably sprayed with chemicals. I would just cover them with an organic mattress cover to be safe! 3 days before my wedding my hubby and i were painting our new town home. friends came over. we painted all the baseboards, it was a weeknight, just a couple hours with the windows open. I had half a glass of wine after we finished painting. Too tired to stay up and finish it. We drove back to our apartment. I woke up hungover. Didn’t make sense. got enough sleep. didn’t overdrink. ??? it was the paint fumes. luckily i was better in 24 hours, or at least functional. hugs to you caroline, i wish you a speedy journey to well being. we bought my allergy kids organic mattresses 2 years ago, just months after we purchased nasty stinky toxic mattresses online. It was the best investment we could make, even though that was one unfun conversation to have with hubby. new beds again he asked? our retirement savings is slimmer than we’d like, but you know what? my kids aren’t as toxic. their brains work when they go to school so they can learn. it even works so well they are bilingual at age 6 and 8 with no second language in the home. yay for a clean non-toxic home to raise my marvelous boys in. so to any of you deciding whether or not you should forfeit your vacation or retirement savings to invest in a bed that won’t poison your brain, yes, yes, yes! caroline – have you heard of this story/resource. this may help you when making decisions on what to buy that won’t poison you. make sure you read allison’s story and marilee’s story. they are both tales of recovery from environmental poisonings. get your tissues out before you read, it’s a real tear jerker. This is a great reminder–new mattress or not–to open the windows in your house as often as you can to let indoor pollution out. We use all-natural soaps, cleaners, etc., and have an electric stove, so we don’t have a LOT of indoor pollution, but I still always sleep better every night, even if I only get to open the windows for 10 minutes. I try to open all the windows and doors to get a cross-breeze going. We bought a “new” bed last year–it was a floor model, so it had offgassed for at least a couple months, but it still had a pretty strong chemical smell (I HATE that smell, like new carpet. Blech! ), so I actually blew up the air mattress, and slept on that for a couple weeks while we left the windows open all night and day, with the ceiling fan running above the bed itself. This significantly decreased the toxic smell, but for someone as sensitive as you, it would probably still not be a good idea to have a “conventional” bed! Bless your heart, I’m so sorry this happened to you. Don’t take this the wrong way, but I believe that you have been given a gift to be more sensitive and use your other gifts to help share your experiences and spread the word–our culture has gotten so far away from what is normal for our bodies that most people don’t even recognize the problems of daily toxic loads. Thank you for taking the time to share your experience and help others avoid–if not as drastic an experience as yours, the less-obnoxious but still pervasive effects of toxins. On another note, I was reading about *ahem* coffee enemas the other day (Now, WHERE did I read that? Oh yeah, on Kelly the Kitchen Kop! ), which sparked more research for me, and I learned more about how they can help detox a body of heavy metals. At 18, I believe that you are no longer considered a child (biologically-speaking, of course), and of course coffee in enemas is not recommended for children. You may or may not wish to write about it if you use them (totally up to you what you do and don’t share, right? ), but if you don’t already use them, you might want to research if it would help detox Antimony. Dani!! wow I loved all you had to say, You are so sweet. I agree that my sensitivities bring light to so many blind people! I do do back tea enemas when I get really toxic feeling, and it helps! (coffee gets me wound up!!!) I am glad you knew to at least outgas yours! Thanks again for all your support! Wow–it makes sense that mattresses are toxic, but I never thought about it before! I got a new mattress just this year, but thankfully didn’t have any reaction. Your reaction sounds so scary! I am definitely going to order a mattress wrap, like mentioned in the previous comment. Yes! an organic mattress cover is very good. Look at moss envy! Thanks for reading this Lauren! I forgot to mention – thanks for sharing your story! It’s actually cheaper than I thought it would be ($38 for queen/king wrap). I am not a person who tends to have reactions to things, but after sleeping in a hotel for 3 nights on a vacation in July (a nice hotel that has beds I usually love), my face swelled up and my skin dried out (weird – tight, cracked lips almost overnight) as if I was having some sort of allergic reaction. I assumed it was something they used to wash their sheets, but now I’m wondering if it was the mattress (I brought my own pillow). Interesting!! It took about 2 weeks for my swelling to go down and the skin to go back to normal. It is horrible that the government that says it knows what is best for us makes the companies do this! I get so mad when I think of all the things “they” think is healthy and force upon companies (and thus force upon us). Granted many companies are doing horrendous things all on their own but THIS is due to government regulation. I guess what I am saying is that in this particular instance we need to be angry at overreaching government regulation. I wish the government would just require all the facts be on the label and then let us decide! I agree Michele! I was so mad and I didn’t know who to blame..i guess I cannot blame myself, because how was I or my parents suppose to know, if no one ever told us! I bought an organic rubber mattress from Lifekind in, I think, 2006. Love it. Expensive–including shipping it from California to Virginia, but it has been worth it! It has a 25 year warranty. Don’t forget your pillows and sheets as well! I have wool and rubber pillows from Lifekind, and beech “Modal” sheets from Bed, Bath, & Beyond (supposed to be from sustainably raised trees and not have the chemicals/pesticides that nonorganic cotton and the like can have). I did not quite understand the above–reading very fast here at work–all mattresses made after 2007 have toxic chemicals? Even the organic ones? Wondering if Lifekind had to comply with this? They are (or were for me back then) VERY helpful on the phone, so I’d call and ask them! No I don’t think organic ones have chemical after 2007, organic is the exception. Its just the regular mattress that are toxic beds! Thanks for your suggestion, other readers will appreciate this! I am sorry to inform you that that’s is not correct. Companies are allowed to sell organic mattress and deliberately omit the fact that they may have a flame retardant insert close to the surface. I also got severely ill from sleeping on a conventional mattress for 8 months. In my case the upshot was a large tumor caused by the PDE’s. The only company I found to be completely on the up and up was abundant earth. I tried to save money and purchase an additional mattress from Soaring Heart and let me tell you … I got the same symptoms! Palpitations, under eye circles, headaches and puffy face every morning. Soaring Heart swears that all the materials are organic so it could be the way the wool was processed and no, I am not allergic to wool as my Royal Pedic is made with it. This is America folks and false advertising is aided and abetted by our regulatory agencies …. the same ones that are supposed to protect us! Be careful of manipulative terms such as “sustainable” “green” “natural” and even “organic”. My royal pedic organic cotton/wool mattress is well worth the thousands I spent on it. There is one company, either Serta or Sealy, can’t remember which that started using flame retardants in their mattresses as early as 2004. Do your homework and be careful! This is a horrible thing for you to go thru. It is outrageous what manufacturers can get away with these days. As you mentioned it is bad enough what goes into our food, but everything in our homes are toxic as well! Thanks for posting. I thought about how expensive our mattress was when we bought it a few years ago. I can only guess how much more expensive an organic mattress is. I have been wanting to replace the mattress of my childhood bed, which is in our guest room, because it is so thin and tiny, not to mention pretty old. It is probably safer then what they have out there today. Yes keep your old little one and just get an organic mattress cover which will make it seem like new…other then the squeaks! I’m moving in Oct and am going to be buying a new bed. If anyone has any recommendation on places to buy a healthy mattress, I’d love to hear it. This post was very timely for me…thank you. I don’t see the links either! Sorry it says my comment is awaiting moderation..
We have bought 3 mattresses from this company. TOP NOTCH! No chemicals!!!!!! LOVE THEM!!!! Cozy Pure. I had forgot about mattresses being full of chemicals. My husband and I are going to be buying my son and his fiancee a new bed for their wedding gift. I am so thankful for reading this first so we can purchase organic. So now I just need sources for where to buy them. Oh what timing. I am going to be getting a new frame and mattress soon, both from that ubiquitous Swedish furniture store. Now I am wondering about looking for other options. Soil, I strongly advise you to get an organic mattress or even a hand made one, if you can find someone. Good luck! I post links to mattress in the comment above. We got very, very sick from our IKEA mattresses, though we really love IKEA otherwise. It was so bad that we could no longer even be in the room where the mattresses had been, even though we got rid of them right away. Yes, My dad got my mattress out of the house in a blink of an eye after I had my reaction…this is really real stuff! I bought an ikea mattress YESTERDAY! Joe asks can anybody tell me if sleeping on a piece of 1/2 ” plywood under your mattress to make it a little firmer expose you to enough fumes to cause upset stomach and an enlarged kidney? Been on the bed for about 2 months and I started getting sick almost every night after about the fifth week. Wow. A much-needed and extremely informative piece. Can you or Caroline point us in the direction of some makers of natural/organic handmade mattresses? CozyPure – we have bought 3 from them. Their customer service is amazing (Hans is great!!!) and they are so willing to walk you thru the process of choosing which will be best for you! Are you sure you don’t have this backwards? I was under the impression that fire retardants in mattresses were banned in California 2007. I recommend a natural mattress made in Canada. We don’t have the same fire retardant laws that you have in the United States. Green Sleep ships through its dealers to the U.S. it is all organic natural. I love it. I have the same sensitivities as the writer of this blog. Marshall Matresses are the best Canadian made mattresses, available on order from The Bay.